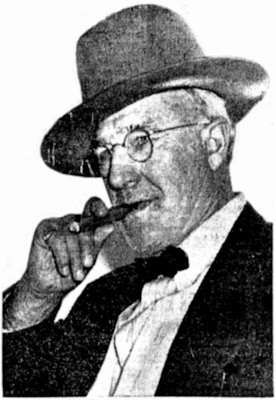 Mayor Piney Leifer (1873-1942) in a 1938 newspaper photo. My first entry in this "Famous Relatives" series of blog posts was about the actor Richard Gere. But the majority of my famous relatives are nowhere near as famous. Famous is an elastic term. For the purposes of this blog, I’m going to consider someone famous as long as that person performed some sort of career or accomplishment in the public eye, even if that public was relatively local. My first cousin three times removed, Piola Leroy “Piney” Leifer (1873-1942), was the mayor of the small town of Brewster in Stark County, Ohio, where he lived virtually his whole life. He first won election as mayor in the fall of 1930 for the term that began January 1, 1931. Evidently he was quite popular with the voting citizens of Brewster, since he was re-elected five more times. He filled the office of mayor for six consecutive terms until his death in 1942 interrupted the sixth term. Piney Leifer was born in Justus, Stark County, Ohio, the child of Swiss immigrant Jacob Leifer (1842-1922) and his wife Katharine Ann Werstler Leifer (1839-1904), and he was the nephew of my great-great-grandmother Louisa “Lucy” Leifer Shanower (1856-1916). Before he entered politics, Piney was a farmer and a prominent horse and cattle dealer. I don’t know why he left that career to run for mayor of Brewster, but the timing of the career change suggests that perhaps his horse and cattle business was hit hard by the Great Depression. The Depression years of the 1930s were difficult all across the USA, but Mayor Leifer performed the feat of keeping the village of Brewster financially solvent throughout his mayoralty. Only a few other Ohio municipalities of that period could boast the same feat. During Piney Leifer’s administration Brewster, Ohio, built a waterworks system, sanitary sewers, a sewage disposal system, and a municipal building. Brewster paid off the debts from this construction and built up its bank account. Mayor Leifer also had the village implement a locally operated power system, distributing power purchased from the Ohio Public Service Company to residents. The income to the village from resales of power funded village improvements, but after the new municipal building was paid for, the village cut the charge for power by fifty-five cents a month for average consumers. Several months after Piney Leifer was elected mayor of Brewster for his sixth term, he grew ill. He never married, so he moved in with his sister Celia Catherine Leifer Roush (1876-1948) and her husband Andrew Jacob Roush (1874-1954). Nine months later, on December 16, 1942, he died at their Brewster home. His successful guidance of the village of Brewster through the tough Depression years became his legacy. “Think how much interest would be saved if municipalities bought things only when they could pay cash for them,” he was quoted in the Canton [Ohio] Repository, October 9, 1938. “We pay as we go—that’s our system.” Still good advice—and not just for municipalities, but for individuals, too. In my very first post for this blog, I asked the question: “Who was Henry Shanower?” That’s a question that Shanower family researchers keep running up against. We can trace the Shanower genealogy back to Henry Shanower, who died sometime in the early 1800s in Adams County, Pennsylvania. But no one has been able to determine Henry’s parents, much less siblings—or even the name of a wife. It’s not as if there are no records of earlier Shanowers. There are plenty. 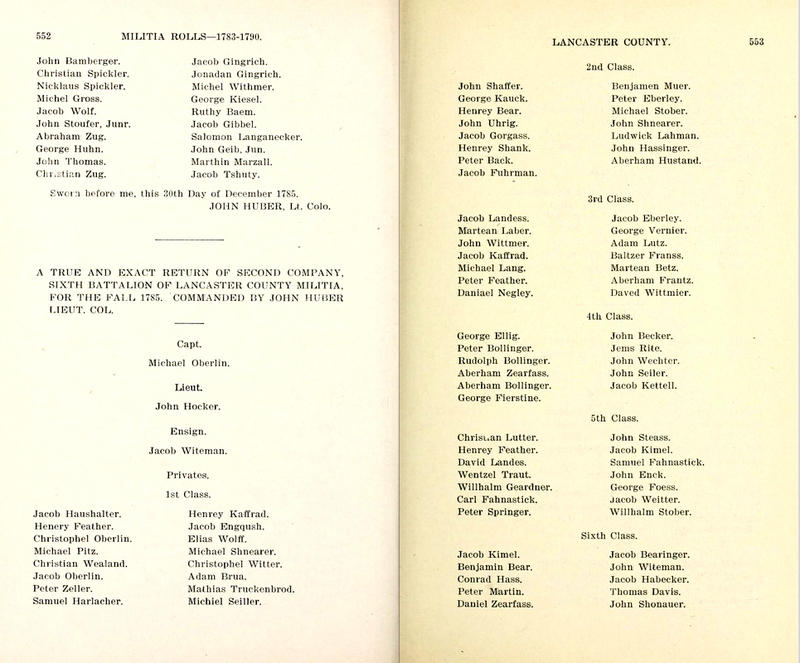 Spellings of the last name vary widely—Shonower, Shonauer, Schoenauer, even Shinaver. Records of earlier Schonauer generations extend back through Germany to Switzerland in the 1500s. So there’s a gap between the two sections of the Shanower family tree. How does Henry Shanower connect to the earlier Shanowers? That’s the big mystery. After many months of sifting available evidence, I've come up with a possible solution. I want to stress that this is simply a possible solution. I can’t claim that it is the solution. I don’t know whether anyone will ever be certain of that, since so far there’s no proof. Anna Schonauer, #1, can be discounted as Henry’s direct Shanower ancestor because any children she had would have carried her married name, Gehman. Jost Schonauer, #2, arrived in the USA on the ship Phoenix in 1754, very possibly in the company of Anna Schonauer. But women weren’t generally listed in passenger lists, so who knows? Jost was probably a relative of Anna, perhaps her brother, but I have no proof of that. Christian Gehman (Geimmer), Anna’s husband-to-be, was on that Phoenix voyage, too, so maybe they were all traveling together. Jost’s descendants have been pretty well traced by his great-great-great-great-grandson Robert Cole and there doesn't seem to be any point where the Henry Shanower branch of the family fits among them. Other details indicate these two branches of descendants are distinct. Jost’s early descendants lived and died in Berks County, Pennsylvania—mostly in Cumru Township—while Henry Shanower died in Adams County. Jost's line was Lutheran while Henry's line seems to be German Reformed Brethren. And the spelling of the Shanower name evolved differently in Jost’s branch. It’s unlikely that Henry Shanower was Jost’s descendant. Christian, #1, didn’t marry and seems to have had no offspring. Abraham, #2, had no sons. He and his wife, Barbara Graff Schonauer (1731-unknown), had three daughters, but none of the daughters passed down the Schonauer name, of course. Child #1, unknown, was not yet born when its father Jacob died in 1764 in Lancaster County, Pennsylvania. This child has seemed to Shanower family researchers Vel Shanower Kirchner and Dan F. Shanower to be the best candidate for the identity of Henry Shanower, and until now I’ve agreed. However, I’ve found no evidence that this child even survived childbirth, and the only gender I've seen associated with this child is female, although I don’t know whether that’s proven. If she lived to have children, a female wouldn't have passed down the Shonower name. Barbara, #2, was certainly female and wouldn't have passed down the Shonower name. That leaves John Shonower, #3, the eldest of these three children, born about 1760. John left records of his existence. In 1774 at fourteen years old he inherited whatever was left of his father Jacob's estate. He belonged to the Lancaster County Militia in 1785 and may have fought earlier in the American Revolution. In the 1780s he paid taxes on land in the municipalities of Warwick, Bethel, and Cocalico, all in Lancaster County, Pennsylvania. In 1781 he married Elizabeth Handshue (bef 1767-unknown) in Cocalico Township. John Shonower, here spelled Shonauer, belonged to the 2nd Regiment, 6th Battalion of the Lancaster County, Pennsylvania Militia during the fall of 1785. His name is last on the right-hand page. Click picture to enlarge. Who were John Shonower and Elizabeth Handshue Shonower’s children? I don’t know. Maybe they didn’t have any, but that would have been unusual for a married couple in Lancaster County, Pennsylvania, in the late 1700s. 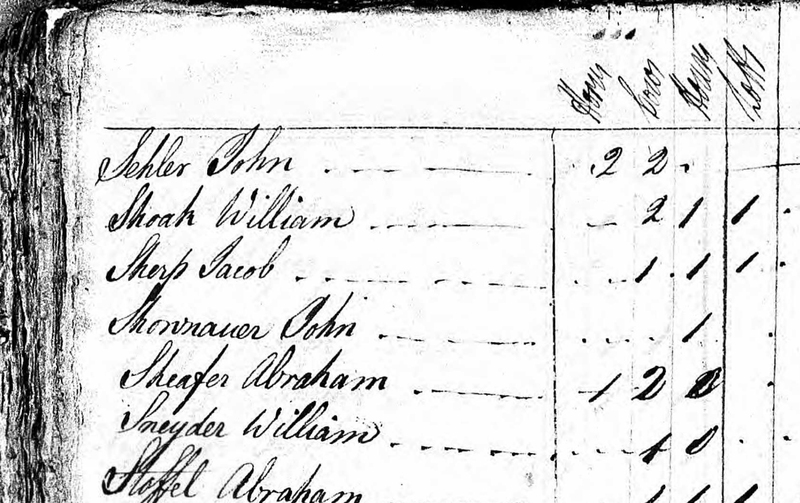 John Shonower, here spelled Shownauer, is listed fourth on this page in the Cocalico Township, Lancaster County, Pennsylvania, tax list for 1785. So here on one hand is childless John Shonower, born about 1760. And on the other hand is parentless Henry Shanower, likely born about the same time as John, since Henry’s only known child was born in 1785. If only Henry's child, Jacob Shanower (1785-1829), had been a son of John and Elizabeth, not a son of Henry! If only John had actually been Henry! Wait a minute—let’s take a closer look at Henry Shanower. The source of the name Henry Shanower (Shaneour). Where did the name Henry Shanower come from? 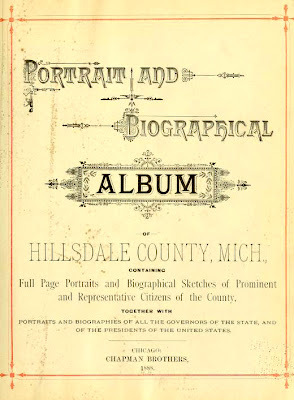 The only recorded evidence I know of for Henry is in the 1888 book Portrait and Biographical Album of Hillsdale County, Michigan. Henry Shaneour is said to be the father of Jacob Shaneour and the grandfather of David Shaneour (1812-1897). (You’ll notice the spelling of the last name has evolved again. David Shaneour deliberately changed it after he quarreled with the rest of his family.) How reliable is the information in Portrait and Biographical Album of Hillsdale County, Michigan? Books filled with short biographies and sometimes photographs of prominent residents of Midwestern counties seem to have been all the rage in the late nineteenth and very early twentieth centuries. Every county had to have one. They are a great help for general genealogical guidance—but for guidance only. They are not reliable evidence. Their information must be verified by external sources before it can be counted on as true. These biographies contain mistakes, as I've found time after time, especially mistakes about earlier generations. To cite one example from David Maxine’s family, one of these biographical albums from Kentucky mentions his great-great-great-great-grandmother Amah Anna Lawrence. Only it doesn’t call her by that name, it calls her Lawrence Slainks. It’s clear where the “Lawrence” part came from, though not why the writer thought it was her first name. But one can only imagine where the name “Slainks” came from, since it doesn’t occur in David’s family. I suspect someone provided notes in really bad handwriting to the writer of the entry, who deciphered the scribbles as “Slainks.” Whatever the case, the name Lawrence Slainks has spread like a weed through family trees across the internet. But it’s incorrect. David’s research proves that. So could the name “Henry Shanower” be wrong, too? I think it’s possible, even probable. I even have a logical explanation, although I need to make it absolutely clear that this is speculation. 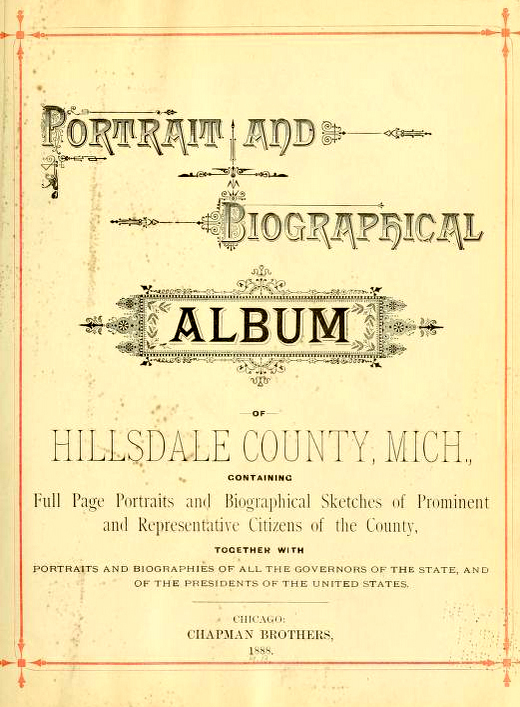 Portrait and Biographical Album of Hillsdale County, Michigan says that Henry Shaneour's son Jacob married a woman named Elizabeth Henry. Think about that—a daughter-in-law with a maiden name of Henry—a father-in-law with the first name of Henry. Could that be one Henry too many? Elizabeth Henry’s name has been independently corroborated. So if there’s a mistake, then it must be with Henry Shaneour’s name, a name recorded nowhere else that any Shanower family researcher has discovered. I think that the person who wrote this biographical sketch somehow got the information mixed up and mistakenly assigned Elizabeth's maiden name, Henry, as the first name of her father-in-law. And so Henry Shanower was invented by accident. He’s a transcription mistake. My solution to the Henry Shanower mystery is that there wasn’t anyone named Henry Shanower. Then who was the father of Jacob Shanower, born 1785? I propose that his father was actually John Shonower, husband of Elizabeth Handshue Shonower. This solution fills the gap and leaves no loose ends. There's geographic plausibility, since the Pennsylvania counties where these Shanowers lived—Lancaster, York, and Adams—are all adjacent. But there’s no proof, no evidence for this solution. There’s only lack of contrary evidence—plus the suggestion of a continuity of first names in this Shanower branch. 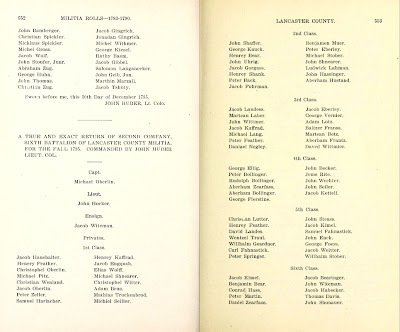 The name Henry, #1, doesn’t occur anywhere else in the Shanower/Schonauer line until much later—in 1859 among Jost Schonauer’s descendants and as David Henry Shanower’s middle name in 1881. Yet other names, such as John, Christian, Anna, and Barbara, were repeated from one generation to another. However, it’s dangerous to draw any conclusion from this. Other Schoenauer names—such as Melchior and Nichlaus—aren't repeated either. And there may have been Henrys in maternal lines I don't have information about. In contrast, the name Jacob, #2, occurs on both sides of the Henry Shanower gap—both among the sons of immigrant Hans “John” Schonauer, as well as among the descendants of the reputed Henry. The name John, #3, also occurs repeatedly on both sides of the gap. 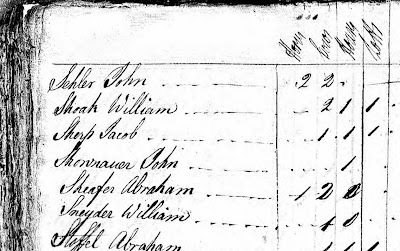 If John Shonower, born about 1760 and husband of Elizabeth Handshue Shonower, is actually the father of Jacob Shanower, born 1785, then there would be a case of John (Hans) Schonauer having a son Jacob who had a son John who had a son Jacob who had a son John. Talk about continuity! In closing let me repeat that this solution—that Henry is in fact John—is speculation. There’s no proof. But considering the available information, I believe there’s no better candidate for the identity of Henry Shanower than John Shonower.